Credit: From Wikimedia Commons by Franco Folini, CC BY-SA 2.0. Poison oak is easily identified by the leaves, which form groups of three and resemble those of oak trees, to which the plant is not related. The leaves can be bright green, but change color during autumn and fall off for the winter. Toxicodendron certainly is a formidable-sounding name for a genus of plants, and in fact all species produce a skin-irritating oil called urushiol, which will cause most humans who contacts it a lot of misery, and possibly a severe allergic reaction. A part of the sumac family, these species are represented in California, where I have lived most of my life, by the notoriously noxious plant known as poison oak. As an outdoor explorer for more than 25 years in areas with lots of poison oak, I’d like to share how it is that I’ve never once been harmed by it. Much of what I know was taught to me by my father, an avid mountain bicyclist, who has been unfortunate enough to have brushed up against poison oak a few times – but taught my sisters and me how to avoid it. Western poison oak is found in many wilderness areas in the western portion of North America, from British Columbia, through the Cascade Mountains, Washington, and Oregon, through the Sierra Nevada Mountains and much of California, and into Baja California. I live with my backyard facing a canyon that is part of Southern California’s Santa Ana Mountains, and walking out my door, in 20 minutes I can be on trails and needing to avoid poison oak, rattlesnakes, ticks, and more. Outdoor exploration is a lot of fun and my favorite form of exercise, although it’s very necessary to know how to be safe. Dangerous plants and animals are important to know about. Much of the advice shared here for poison oak is applicable to its relatives, such as poison ivy, poison sumac, and laurel sumac. The product below contains an affiliate link that generates the author a small commission on purchases made through that link. Important if you are planning on exploring in areas where this plant is located. 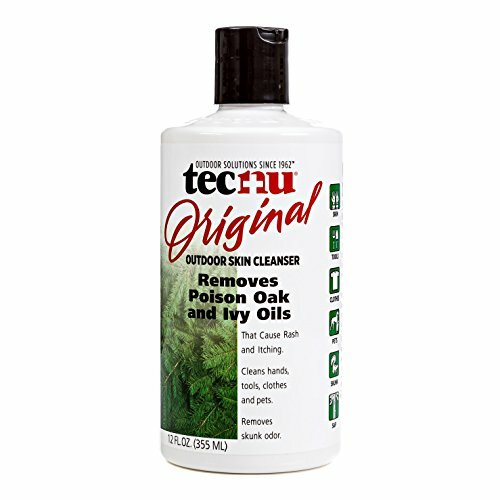 This is an excellent and highly-rated product for cleaning urushiol off your skin should you mistakenly come in contact with poison oak or its relatives, such as poison ivy, poison sumac, and laurel sumac. More valuable than knowing what to do about your skin coming in contact with poison oak is knowing how to avoid getting any on you in the first place. As stated, I’ve been hiking in the hills of California for more than 25 years, and not once have I gotten any on me. (1) Know what it looks like and very carefully watch for it. The plant can form a bush on the ground or it can appear as a vine, climbing rocks or a tree. The photo above shows how the leaves form groups of three. (2) Wear pants if you’ll be hiking anywhere that you are likely to encounter it or that you could possibly brush up against it. After a hike in locations where poison oak is found, immediately washing clothing is a good idea because urushiol can be on your clothes. (3) Be aware of the information, provided below, for what to do if poison oak comes in contact with your skin. (4) Know that in fall and winter the plant loses its leaves, and you can be harmed by touching the bare branches. See the photo below. (5) Never burn poison oak, and don’t touch or pick up a stick if it might be poison oak. Some people have been greatly harmed by using a branch by mistake to cook a hotdog or marshmallows over a campfire. This can result in hospitalization. Credit: Credit: From Wikimedia Commons by Elf, CC BY-SA 3.0. Poison oak changes color during autumn, and has no leaves during the winter. The bare branches can still cause harm, just like the leaves, during winter months. Sensitive individuals who come in contact with the oil found on the leaves of these plants can experience an allergic skin rash, which is called urushiol-induced contact dermatitis. The severity of an individual’s reaction depends upon genetics, how much urushiol got on their skin, and length of time. Washing it off with soap and water can work if it just happened, although within 10 minutes half the urushiol is absorbed, and therefore washing it off ceases to be effective. Skin can be damaged by the toxicity. Mild rashes can be dealt with at home. You can apply a wet cloth or soak the area in cool water to soothe it, and calamine lotion or aloe vera gel can be used to help relieve itching. Do not scratch the rash, which can worsen the problem. This is very difficult because it can burn and itch a lot. There are other at-home remedies for treating poison oak, although if the methods mentioned above don’t provide enough relief, my recommendation is to see a doctor – particularly if you have severe symptoms, or if a rash is covering a large area. Doctors can prescribe corticosteroids to help clear up a poison oak-induced rash. Something else to be aware of is that certain medicines should not be used. These include topical antihistamines applied to the skin, such as diphenhydramine, topical anesthetics with benzocaine for numbing pain, and topical antibiotics with neomycin, such as Neosporin. I especially like your advice about not touching branches or sticks (since it's not just the leaves that are problematic). I'm sure your advice will help many hikers and campers avoid poison oak. Thumbing and pinning, etc. It's literally everywhere, right along trails, in the hills near my home. And I've somehow managed to never touch it with my skin. From seeing my dad's reaction to it, I'm extremely glad that I've been so lucky. I suffered from brushing up against poison ivy numerous times at our cottage (as a child). And calamine lotion didn't help all that much. Prevention is the key (as you pointed out). Great article and I am glad to see that cleaner to take off the oil, good prevention. When I was 13 we moved from San Francisco to Marin county. We did not know about poison oak. Dad cut down some trees our first winter there and burned the logs. We all got it from the smoke from burning the logs and from touching the area around the fireplace. I had it on my face hand and lower legs. It happened the weekend that President Kennedy was assassinated, 22 Nov 1963. What an awful experience. Not the way anyone wants to learn about this! Good to have a picture of it even, TanoCalvenoa. Anytime I hike I wonder what it looks like. Thankfully I've never had it. Appreciate the tips and the treatments. Excellent article, as always. Glad to know what it looks like. I just recently started hiking again and this is a good reminder. Thanks.